I was fourteen years old and the year was 1963 when I first heard an electric guitar playing live. The sound was coming from the house next door. I made friends with that sound and it’s maker. His name was and still is Ivor Roberts. He was 16 years old and very accomplished on guitar. I spent the following weeks as his drummer. My drum-kit consisted of a knife and fork and a hardcover book…I forget what the book was called. I arrived home from school one day and to my amazement found a new drum-set set up in my bedroom. My dad took the hint I guess. The drum-set…my first…consisted of an 18" bass drum, a 2" piccolo snare drum and one 12"bop cymbal mounted on the bass drum. One snare drum stand and one bass drum pedal finished this fine kit. Both drums were finished in gold glitter and were supplied with calf skin drum heads. On the front head of the bass drum was displayed the proud logo: "Gigster". I was later to find out what "gig" really meant. 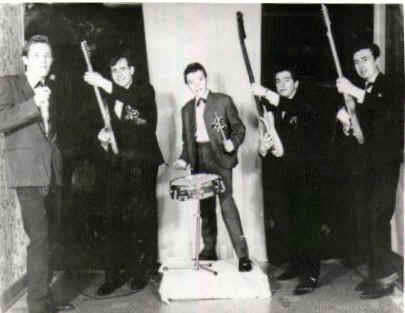 My very first band: "The Club 4" was basically an instrumental group much like "The Ventures, but more like England’s "The Shadows". The Club 4 played extensively all over South Wales…usually rugby clubs, working men’s clubs etc. We would play two sets a night, in between the bingo sessions. I earned enough money with Club 4 to buy a new pro drum set: A spanking new blue Pearl Premiere kit complete with tom toms, hi-hat and even a set of new Zyldian cymbals. The Premiere kit took me through the following year and one more band: "The Misfits". It was with the Misfits that that I played my first real rock n’ roll, covering the Stones, Beatles and of course Chuck Berry. It’s was now 1964 and I’d left school early playing rock n’ roll (for money!!) but my dad insisted I work a day job just in case things did not work out. He got me in his own firm of painters & decorators. I lasted a few months before becoming a sign-writer for a local publishing company, playing gigs at night with The Misfits. We were a bunch of die hard rockers and getting quite popular locally. Meanwhile, The Iveys were starting to gig locally and were looking to replace their drummer, who being stuck on the night shift at work couldn’t make the gigs. At this time I had not even heard of The Iveys. When I turned up I noticed that they looked like a bunch of "Mods" and they started to play Tamala Motown, Beatles, Yardbirds etc. Pete kept wincing at my bass drum patterns saying that it was "putting him off". He put on the 45’s on the record player and was surprised to to find I was playing it right…He’d never heard a loud kick drum before! After playing for an hour, the Iveys left the practice room and debated amongst themselves…Feeling like an idiot, I waited...and waited, for the Iveys decision.